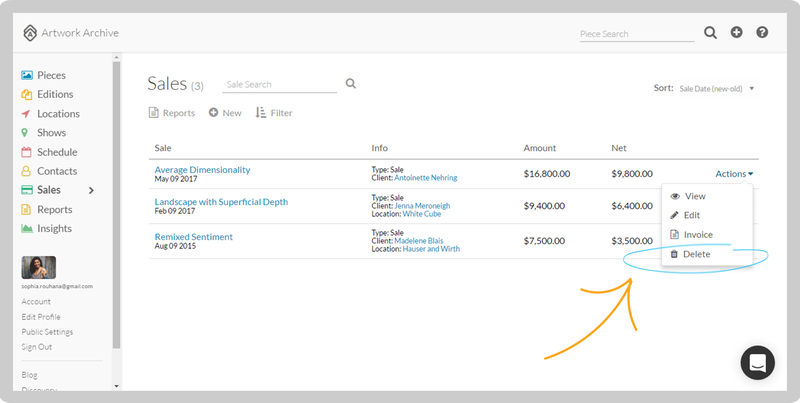 Click on Sales in the left-side menu. Click Actions to the right of the Sale you want to delete, and select Delete from the drop down menu. Or, click on the Sale, then select Edit above the Piece and click on the red trashcan icon. NOTE: The deletion is permanent and you won’t have access to the associated records recorded with that Sale. The Piece will be returned to your Inventory. You can always re-register the Sale if you click this by mistake.